Content Marketing - How to stand out in 2017! | KateCoote. Content Marketing – How to stand out in 2017! A staggering amount of new content is generated every second online. Yes, that’s every second… Check out Internet Live Stats, a live map that shows exactly how much activity is happening around the globe, down to the second. With that amount of competition it’s even more important that you make 2017 your year to stand out from the crowd in content marketing. 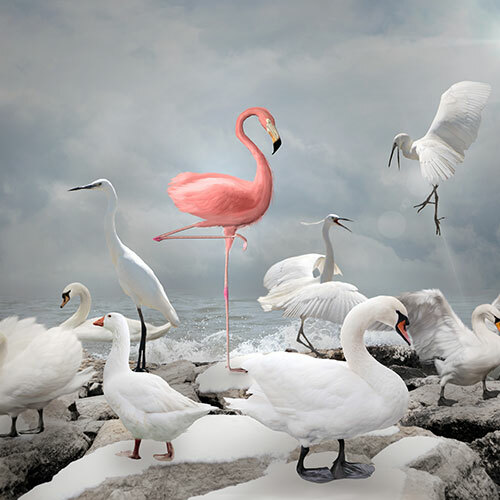 Mundane isn’t going to get you anywhere, humdrum is never going to be hot, and tame is just plain tiresome… So you need to up the ante if you want to be the pink flamingo in a gaggle of geese! I’ve put together a list of 5 top tips to help you achieve content marketing success in 2017. It’s not all about you – Strengthen the relationship between your company or brand with your online audience by getting them to create content for you, it’s a great way to build a tribe. Want a great example? Think GoPro! Get your Jackanory on – Storytelling is a must for content marketing in 2017, stories work because human brains are hardwired to remember them. I’m not just talking about your brand story, think about sharing an employee’s story (with their permission), a customer’s story (with their permission), or your own story… Just be sure that any story you do share is authentic. Go live – Facebook live, Instagram videos… Be there, be present! Ditch your sales pitch, just be you, don’t worry if you um or err when you are recording, we all do it! Be credible and legitimate, not rehearsed! Less is more – Quit churning out content for the sake of it… Stop scouring the Internet for crazy memes so you can share on social media ten times a day! Think quality, not quantity. One well-written blog post a week, can be repurposed for many channels, so make it a good one, go green and recycle! Think you’ve got nothing to blog about? Think again! Sign up to my newsletter (visit my home page) and I’ll send you 10 Top Tips to Inspire your Creativity.